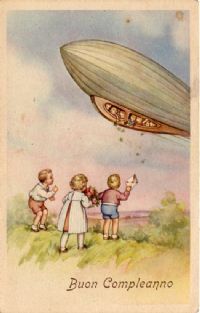 All type of Blimp, Zeppelin or airship related postcards. Here is a beauty! It is an original 1900-1905 era postcard. 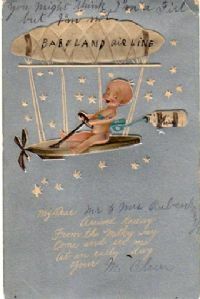 It is embossed and pictures a baby piloting an early airship or dirigible! A propeller is at front. A baby bottle with hose trails behind. Back of postcard is divided and postmarked "Chicago IL 1903". Condition- Fair to good with some wear at each corner as shown.